I’m often asked about pressure management in seating and specifically in relation to the cushions. There is a lot of incorrect information out there in terms of pressure management and cushions, so I wanted to write this blog to outline some of the challenges around this issue and provide some evidence-based solutions. A specialist mattress or therapeutic surface such as an air alternating or low air loss mattress. Pressure cushions – e.g. air alternating, gel, foam-based cushions. There are some good pressure cushions available which can contribute to protecting the integrity of the patient’s skin. These are long-standing products which are widely used and well marketed around the world. However, research shows that the cushion is only ¼ of the solution when it comes to pressure management in seating. 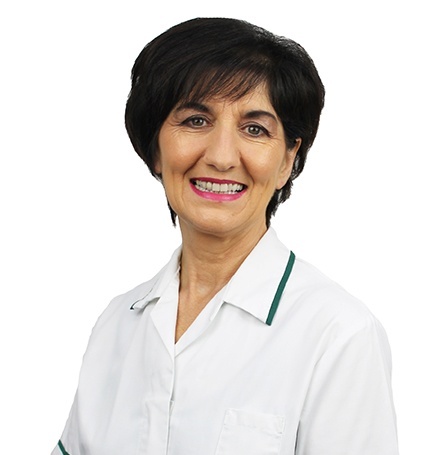 This blog is very useful for enterostomal nurses, wound care nurses, tissue viability nurses who will all primarily be dealing with wound care but also occupational therapists, physiotherapists, care assistants and anyone dealing with seating to manage pressure risk in patients with low mobility. When clinicians are considering pressure management in seating, it is still common practice for many to think only about the cushion on the chair and not the other features of the chair itself. This can often lead to an over reliance on high cost pressure cushions to solve this clinical problem. 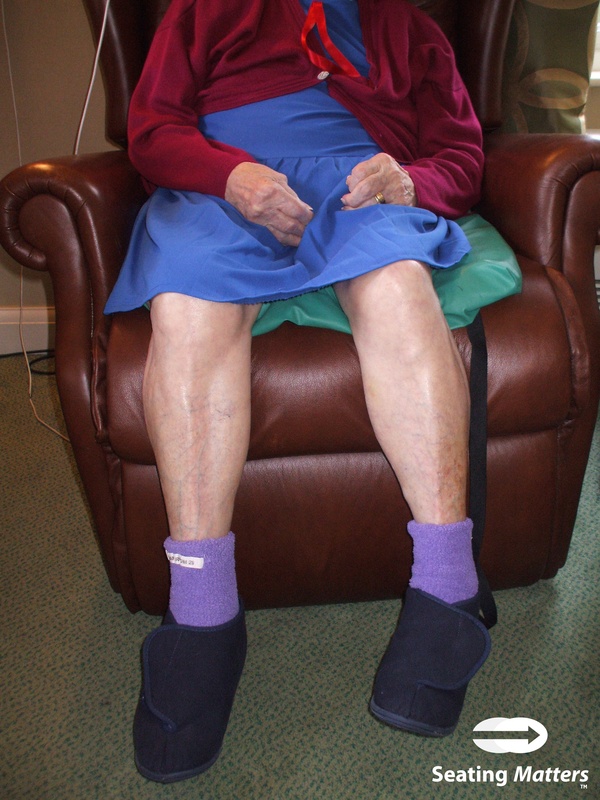 The other chair components have a vital impact on pressure redistribution in seating and without considering these other features, the patient may still be at risk of pressure ulcer development, even with the specialist cushion in place. 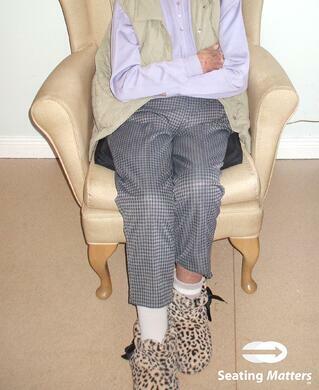 Patients with low or no mobility due to their age, an accident or illness, who sit for long periods of the day. Patients who cannot reposition themselves independently when they get uncomfortable. 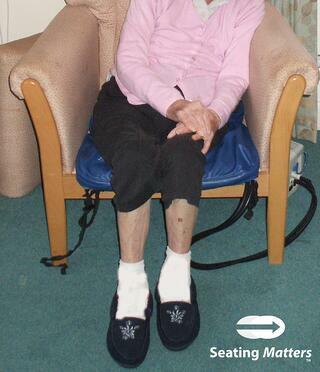 These patients might slump to one side, forward or slide down the chair, needing help from carers or family members to regain a midline posture. Patients who have thin skin and who are a high pressure injury risk. Patients who are hoisted for all transfers. Often key things are missed in terms of reducing pressure ulcers in seating by adding just a pressure cushion to a patient's chair to redistribute or ‘relieve’ pressure, without considering the other aspects of the patient’s seat. 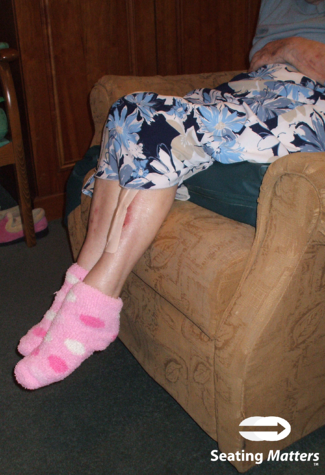 By focusing on the cushion alone, key opportunities for combating pressure ulcers are being missed and we can sometimes increase the risk to the patient. Pressure is reduced by increasing the surface area contact of the person’s body with the chair. When the body is loaded properly, the feet, legs, back, arms and head are all in contact with the seat. However, often a specialist pressure cushion is placed on top of a standard armchair, sofa, wheelchair or existing specialist chair. When this happens, we could be adding pressure to their seated area. How? The addition of the cushion alters the fixed dimensions of the chair, often lifting the person’s feet off the ground or off their footplate meaning they are dangling or bearing less weight. The weight from their feet is now going through their seat, increasing the pressure. Therefore, even though they might have a good cushion, the weight and pressure in their seated area is increasing. If a pressure cushion has been stacked on top of an existing standard cushion, or placed on a chair which is too wide, it can reduce the effectiveness of the arms, lateral supports and head rests in holding the person in a good posture. Quite clearly you can tell just by looking at the patient that they do not feel stable nor supported by the chair. They cannot reach the armrests. Their feet may be dangling and not reaching the floor. They might have their arms crossed to stabilise themselves. They might also be leaning to the side, forward or sliding from the chair. Each of these can create friction and shearing forces and can also increase the weight going through one side of the body compared to the other and therefore lead to the development of pressure injuries. Adding a cushion and not considering how this affects postural support can therefore detrimentally affect pressure. independently shift their weight when they become uncomfortable. Shifting weight or repositioning, can lead to increased blood oxygenation and therefore reduce the risk of pressure ulcers. This repositioning should happen a minimum of once every 2 hours and is often required by international healthcare guidelines. The chair needs to allow this effective weight shift to happen by use of functions such as tilt in space, to correctly and effectively redistribute pressure off bony prominences of the body. Simply adding a cushion does not achieve this. The Chair is Already Unsuitable. unsuitable for the patient will not solve the problem fully. If the dimensions of the chair are too big and it does not provide postural support or effective repositioning, simply adding a pressure cushion will not be an effective solution for the patient. During our two year clinical research study we discovered that the use of high cost cushions reduced by 80% in the Intervention Group using Seating Matters chairs. Meanwhile the Control Group had a 60% increase in the use of high cost pressure cushions, yet pressure injuries in this group still rose by 5%. This shows that simply adding a high cost pressure cushion to a chair is not enough to solve the problem of pressure ulcers. To prevent pressure injuries in seating we must look at the whole chair – not just the cushion. The cushion will not be effective unless the first three principles have been implemented. 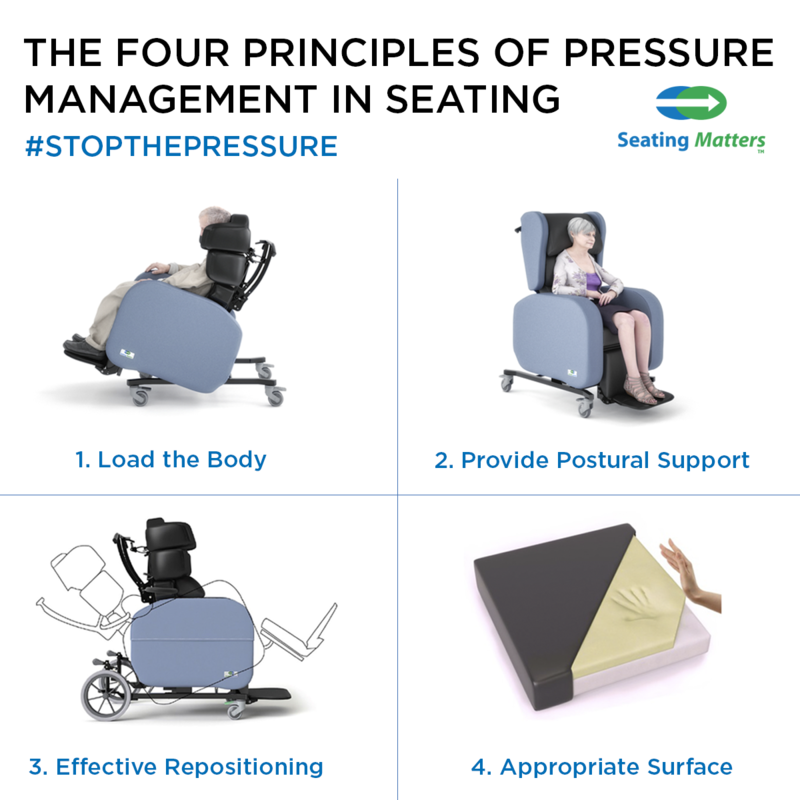 Download Four Principles of Pressure Management in Seating Poster here. First Layer: Two inches of memory foam to allow immersion and envelopment of the Ischial Tuberosities (ITs) into the cushion, this immersion gives stability and reduces shear and friction. It's widely accepted that the ITs need to immerse two inches into their surface for maximum support. Second Layer: A dense layer of foam which provides stability to the pelvis and to the top layer of memory foam. Click here for a download which covers the level of pressure management in Seating Matters chairs. TIP: Test the effectiveness of your cushion with the 'bounce back' test. Press the palm of your hand firmly into the cushion, the contours of your hand should be enveloped by the foam, then remove your hand. The foam should bounce right back. We would recommend for new chair users that you would use the Seating Matters cushion as when used in conjunction with the Four Principles of Pressure Management it has shown a reduction in pressure injuries. This will provide medium to high pressure management. For those at risk of pressure injuries or those who may already have a Grade 3 or 4 pressure injury or open wound, we would recommend that you consult with a Tissue Viability Nurse for their input and refer to your own facility guidelines. On all of our chairs our clinically tested cushion is provided as standard and this is removable. If you are having success with using another cushion we suggest you continue to use it on the Seating Matters chair, adapting the dimensions of the chair to enable the full loading of the body. Can we help you with a clinical question or with a particular issue you’re experiencing right now? My clinical team and I are on hand to answer your questions and help you to change the world of healthcare seating. If you found this blog useful, I’d encourage you to share it with your colleagues and friends to help me get clinical knowledge and research into the hands of patients and clinicians around the world. Thanks for reading and please feel free to contact me with questions and comments. Booking a Seating Assessment for someone who has pressure management needs is essential. 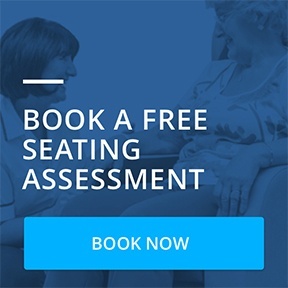 Call us for a complimentary Seating Assessment. We are committed to providing Seating Assessments within 10 working days.